To post to the Woodruff Library blog, you will need to be added to the list of authors. Contact kcolli2 [at] emory.edu to be added to the Woodruff Library ScholarBlogs website. Once you have an account, you can log in to write, edit, and publish your posts. The Dashboard in WordPress is the administrative area of your blog. This is where you can add or edit a blog post. Once you log in to ScholarBlogs, you will be able to see the Woodruff Libraries blog under the My Sites menu in the upper left-hand corner of the screen. A WordPress post is roughly the equivalent of an article in a newspaper. 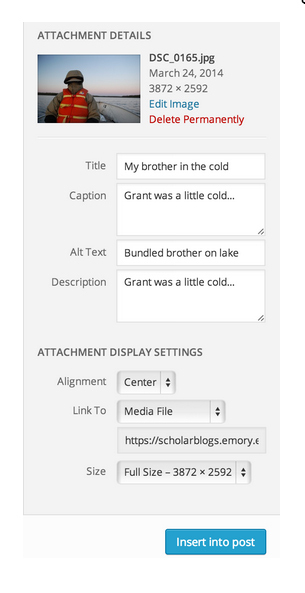 Contributors are welcome to write posts on the blog either using the ScholarBlogs interface or by e-mailing libblog (at) listserv.cc.emory.edu. Pages can be static (this page is an example), or could be where new posts appear (as on the home page of this blog). Please don’t create new pages without asking first. Post Title – This is the title that will be displayed at the top of your page. Permalinks – The permalink defines the unique URL by which your page will be made accessible. By default, the permalink is the title of your page (lowercase and with spaces replaced with dashes). If your permalink is too long, you decide to change the title of your post, or wish to customize the permalink for some other reason, you can do so by clicking the “edit” button. WYSIWYG Editor – add content easily to your post via the WYSIWYG (“What You See Is What You Get”) editor. This functions like a standard word processor and gives you the ability to easily produce a formatted document without having to know HTML. In order to make more advanced changes not supported by the Visual editor, you may view the raw code by clicking on the “HTML” tab to the top right of your post. Upload / Insert – add images to your post / page by clicking the icon to the right of the “Upload/Insert” heading to the top left of your post content. You will then be given the option of dragging and dropping files from your computer or selecting them manually. Once media items are uploaded, you can edit their properties by selecting the “Gallery” link on the top of the “Add Media” dialogue. Click “Show” for the item(s) that you want to edit. Title (Required) – Add a brief descriptive title for your image. This will help your image (and your story) to be found by search engines. Alternative Text (Important) – This is the text that will be seen if the image cannot be displayed (i.e. if the reader has a slow connection or is using a screen reader). Caption – If left blank, then only the image will be displayed. If caption text is added, this will automatically be included as a caption underneath the image in the post. Link URL – By default, WordPress will insert a link to the physical location of the image on the server, so that users who click the image on your page will be directed to the full image. If you would like this to direct the reader elsewhere (i.e. to another page), then you can type the alternative URL here. If, on the other hand, you do not wish your image to be a link, simply delete the URL text or click the “None” button. Size – WordPress will recommend alternative image sizes depending on the size of your original image. WordPress produces three versions of your image in different sizes, in addition to the original. Often people upload large images that take a long time to display, especially on slower Internet connections. The benefit of making use of these built-in size options rather than resizing your original image using HTML is that WordPress’ resized versions take less time to display. Once you have uploaded your image, click the “Insert into page” button to embed it in your post. Please note that the image will be displayed at the point where your cursor appears in the WYSIWYG editor. Categories are a useful way of organizing your posts, increasing search engine optimization and increasing ease of navigation on the part of end users. They are often used in menus and widgets, but are also listed at the bottom of each post as links, making it easy for readers to find related site content. For categories to be the most useful, they should remain generic. 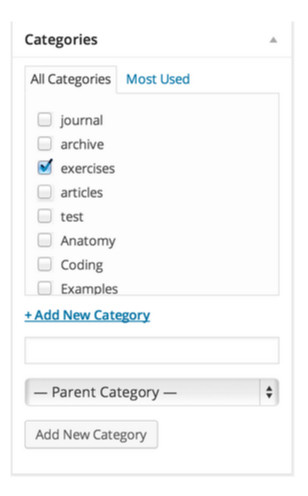 To assign a post to a category, you may select one more more from the categories listed to the right of your post content. Every post should have one or more categories. Please do not create new categories. 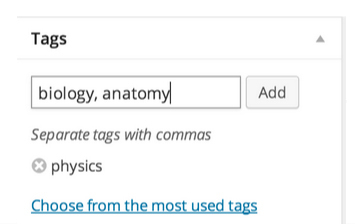 Tags are another way to organize site content, increase search engine optimization, and improve accessibility for end users. They are listed at the bottom of each post as links. You may create as many new tags as you want, but please take a look at the list first to see if there is already a tag that suits your needs. Comments allow readers and subscribers to interact with content on the site. You can enable and disable comments on posts from the “Discussion” box. 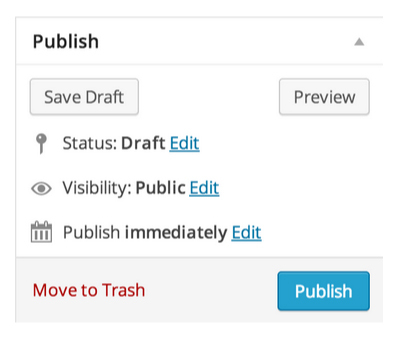 Preview – Clicking this button opens your page in a new browser tab so you can see the changes you have made to your content, without saving the draft or publishing. 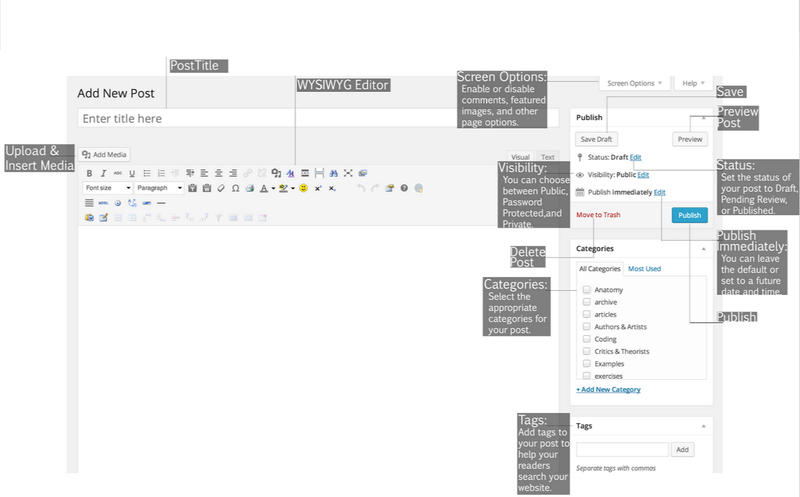 Draft – This will save your page without making it publicly viewable. You can return to complete and publish it later if you would like. Publish – Selecting this option publishes the page to the Web. Everyone with permission will be able to view it and search engines will be able to index it. Scheduling – Rather than publish content immediately, you may choose to make a post public on a later date or time. You can also change the date associated with a particular post if you want to.